Starting at Scarborough - up to Scalby - through the Yorkshire moors - via Dalby Forest (£7 toll road), to the A169 to Hole of Horcum, Goathland, Grosmont - to Whitby Westerdale - Google maps says it may take around 1 and a half hours - so that would give you plenty of time to get to the start and plenty of time to get home afterwards with the majority of the driving being done during the middle of the day when light is likely to be at it's best. Sights to be seen: Scarborough: 1950s cafe/ Harbour ice cream bar. Dalby Forest. Hole of Horcum. 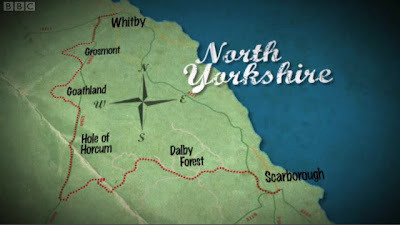 Place where Heartbeat is filmed (Goathland). Whitby Abbey. Next episode is in North Wales: BBC iPlayer, Google Maps Route (roughly), Screen grab from the show. Seeing: Caernarfon Castle, Dinorwic slate quarry, the Llanberis Pass etc. About an hours drive according to Google.